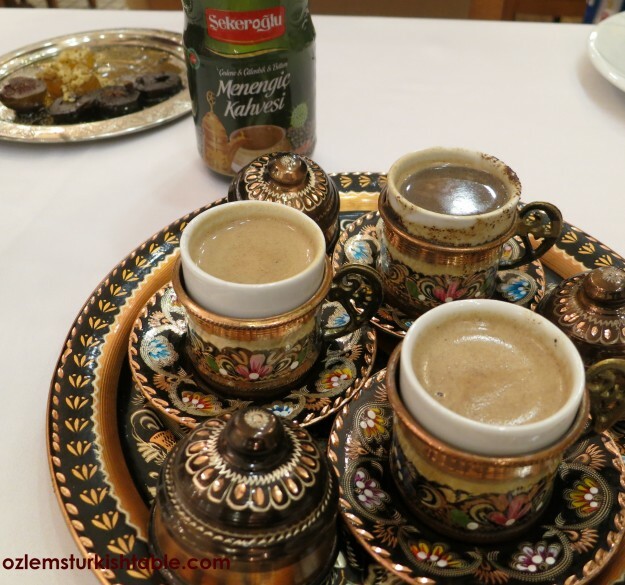 Have you ever tried the deliciously frothy Turkish coffee? 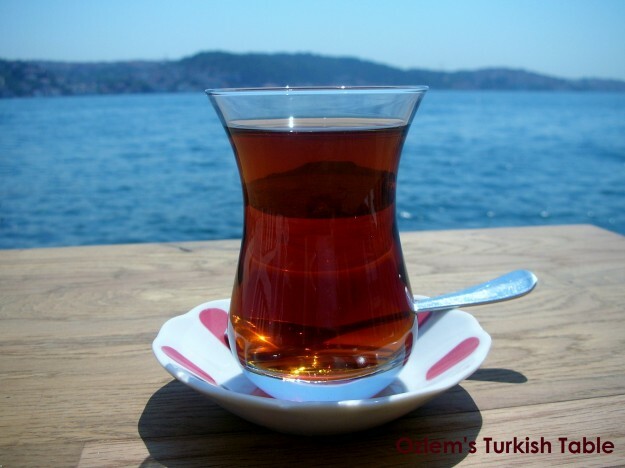 It is one of the most popular traditional drinks at home in Turkey and I love the whole ritual, the experience of it. In Turkish, we have a saying “Bir fincan kahvenin kirk yil hatiri vardir” which means “The memory of a good cup of Turkish coffee lasts 40 years”. Turkish coffee is a drink of friendship; you are offered this traditional, aromatic drink wherever you go in Turkey; when visiting friends and family, in the shops, while waiting in the bank, in hairdressers.. We take time to pause and enjoy this special drink with a friend or family or sometimes simply reflect with every precious sip. 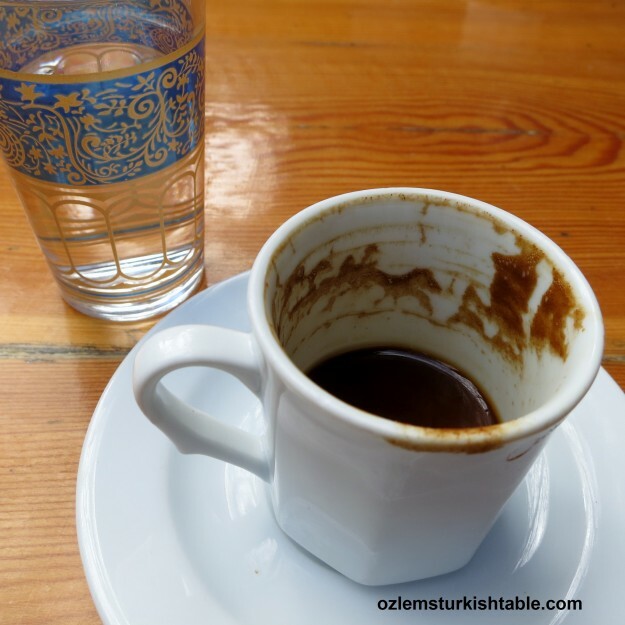 A glass of water and Turkish Delights by the side complete the Turkish coffee ritual. Turkish coffee is made from 100 % Arabica beans that have to be toasted to the point and ground to a very fine powder. When properly made, a delicious foam forms at the top, which is essential to any Turkish coffee. My mother loves her daily Turkish coffee but needs to limit with one a day. If she is ordering in a Café, she charmingly asks the waiter for a “guzel kopuklu kahve lutfen” which means “Turkish coffee with a nice foam at the top please”; that is her treat for the day and she thoroughly enjoys that one cup with a smile on her face. Although Turkish coffee was first cultivated at the southern edge of the Arab peninsula, it was via the Ottoman Empire that the fame of coffee spread to Europe. Within just a few years of its introduction to Europe, hundreds of coffee houses sprung up in Istanbul alone, and coffee drinking became such an important part of daily and ceremonial life that the Sultan’s coffee set was carried during royal processions; every wealthy household had a servant whose sole task was to prepare coffee and under the laws the failure of a husband to provide his wife with coffee was grounds for divorce (so they say)! When I was a little child, my mother used to make us very milky Turkish coffee – so we could join in the ritual with them :). And just for the fun of it, once in a while we used to turn our coffee cup upside down to its saucer after finishing, in search of our fortune. My mother would always see the happiest things inside the cup; if there is “a bird” in the cup, that is good news, if there are “narrow lines”, there is a travel on the horizon; if there are “horses” in the cup, that is good fortune. Nothing ever bad appeared in our cups and we loved listening to mum and this innocent fun with giggles. 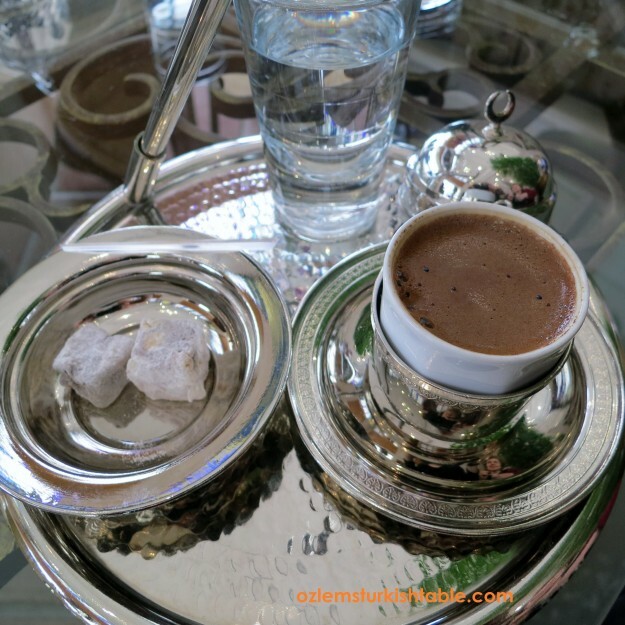 Though not the traditional way, a little hot milk may also be added to Turkish coffee in some parts of Turkey; like Turkey’s For Life experienced in Van; you may enjoy this version if you like it less strong. Please also check out A Seasonal Cook in Turkey for delicious Turkish coffee experiences in Istanbul. How about Menengic Coffee? This aromatic Southern Turkish Specialty features Menengic, known commonly as terebinth and turpentine tree, is a species of Pistacia, and wildly grown in Southern Turkey, part of the national flora. Cooked with milk, you can certainly get the wonderful pistachio taste, a unique experience. 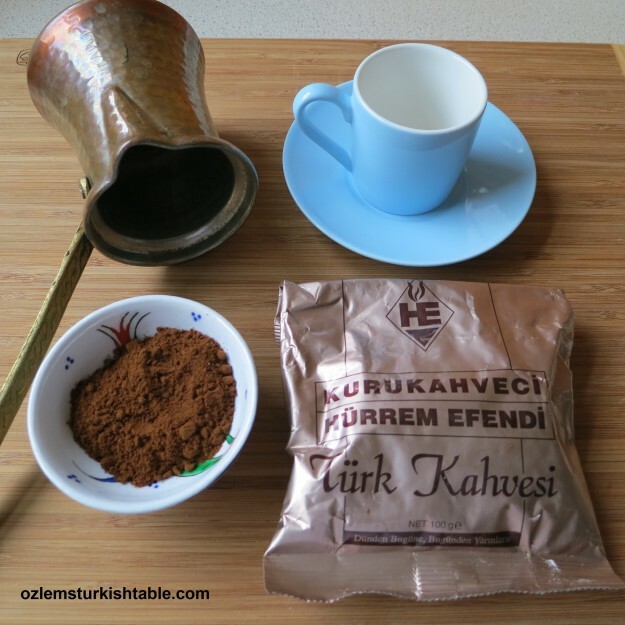 Here is how to make proper Turkish coffee; I hope you can get to try this special drink sometime, if not already; Turkish coffee really is more than a drink for us. Cezve; long handled pot is an essential equipment to make Turkish coffee. To make Turkish coffee, you need the right equipment: a special long handled pot called “cezve” and small coffee cups called “fincan”. The size of the pot is significant. It must hold almost double the amount of the water used to have adequate “room” on the top for the foam to rise. Turkish coffee set; all ingredients that you need! There are different sizes of “cezve”, the long handled pot, depending on the number of persons for whom you wish to make Turkish coffee. A well-made coffee must have froth on the top and you cannot have a good result if you prepare the coffee for 2 persons on a pot for 4. 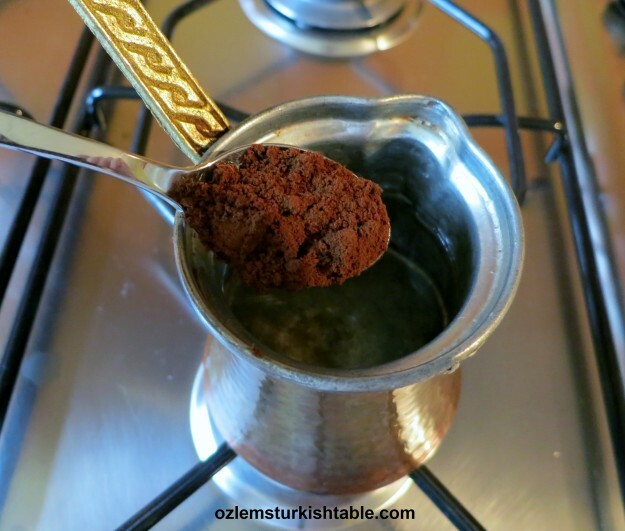 Stir in a heaped teaspoon of Turkish coffee to the pot. Into your “cezve”, put one coffee cup of water for each person, 1 heaped teaspoon of coffee and 1 rounded teaspoon or less of sugar. Traditionally, the amount of sugar should be known beforehand, i.e. “az sekerli” (with little sugar), “orta sekerli” (medium), or “sekersiz” (with no sugar). Skip the sugar if preferred. Stir well, put over very low heat and bring slowly to boil. As the froth forms on top, remove and divide the froth into the cups. As it gently start to boil, the froth forms on top and rise. Just before it overflows, remove and divide the froth into the cups. Then bring to boil again and divide the rest out to the cups. Your Turkish coffee is ready. 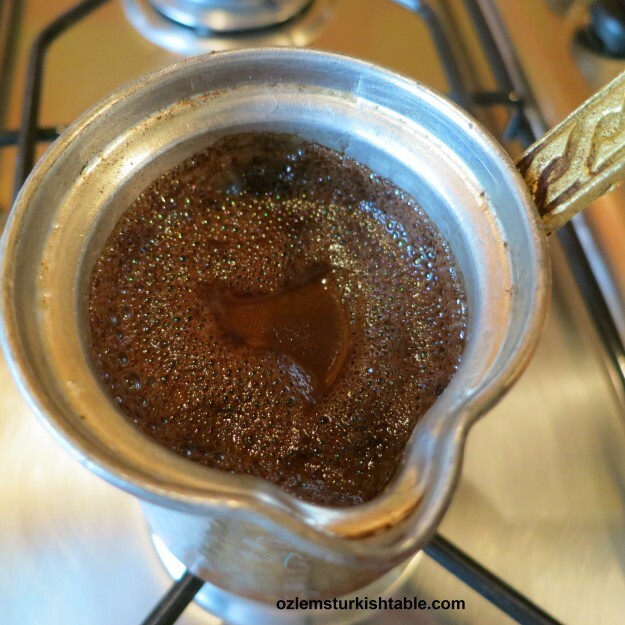 Deliciously frothy Turkish Coffee; Turk Kahvesi, afiyet olsun! 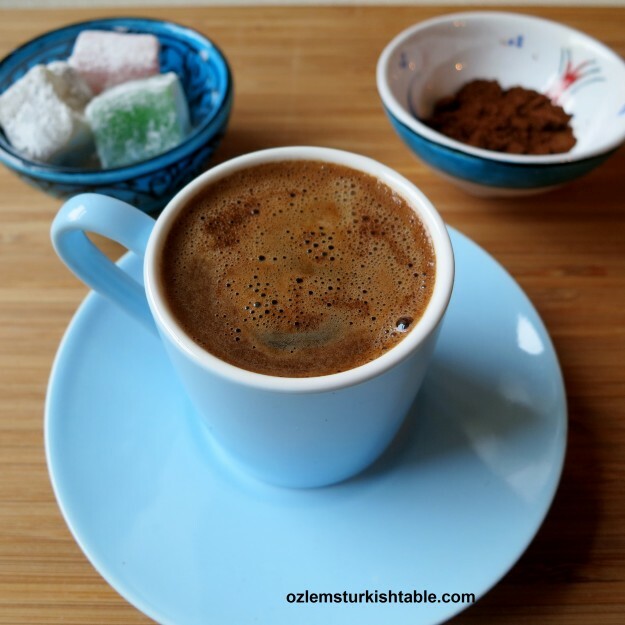 Turkish Delight, lokum traditionally accompanies the Turkish coffee and it is a perfect fit. 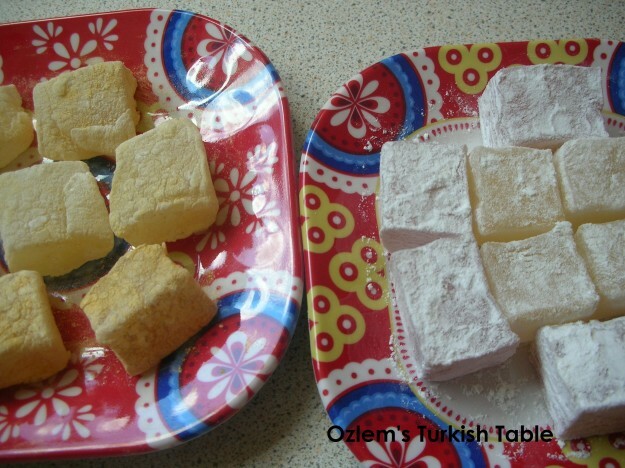 You can also make your own Turkish Delight if you like, here is my Turkish Delight recipe. 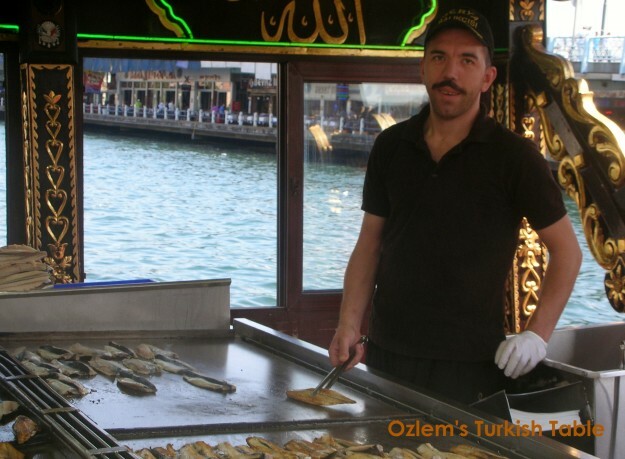 Living abroad, there are certain Turkish food, especially the Turkish street food, places (and of course, people) that I dearly miss – and I am sure it is the same for many of you, who live outside of your homeland. Once settled down at your “new home”, the feeling of missing replaces itself with “how to recreate these treats in your new home phase”. 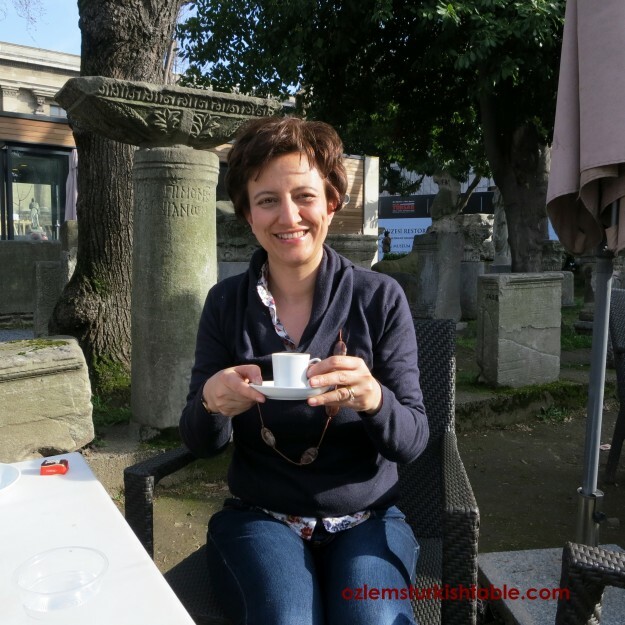 This is how I started blogging about my homeland, Turkey, and Turkish food, and I am grateful to have a chance to connect and share the many wonderful things my homeland offers with you. I am delighted to see that we can recreate many of our favorite food, with a little substitution or tweak here and there. 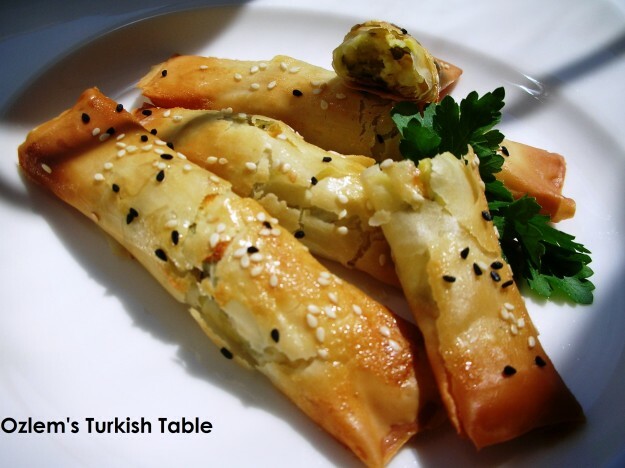 Take the boreks; one of my favorite parts of Turkish cuisine, the stuffed, filled pastries. Traditionally, we would use the fresh, paper thin sheets of pastry, yufka, widely available at home. Living in England, I cannot get yufka, but the filo pastry sheets you can get at the supermarkets work as a good substitution to make boreks. One thing to bear in mind that they can get dry easily, and that you need to keep them moist with a damp cloth over them, while working. Here is a good demo on handling filo pastry. Borekci, borek shops in Turkey sell all kinds of freshly made savory pastries with different fillings, one of my favorite stops! We use different kinds of fillings for our boreks; some with leek and cheese, some with potato, cheese and parsley, onion and ground meat and many more. You can bake these pastries using filo pastry sheets ahead of time, and leftovers can be frozen successfully. My children love these boreks; if frozen, grease a baking tray and place them on the tray. Then reheat in the oven at 180C/350 F for about 15-20 minutes. They magically appear on the table and are gone very quickly! 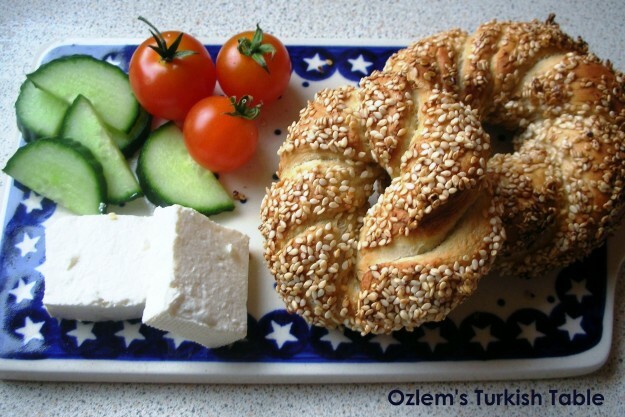 Simit, the sesame seeded bread rings are the ultimate Turkish street food. 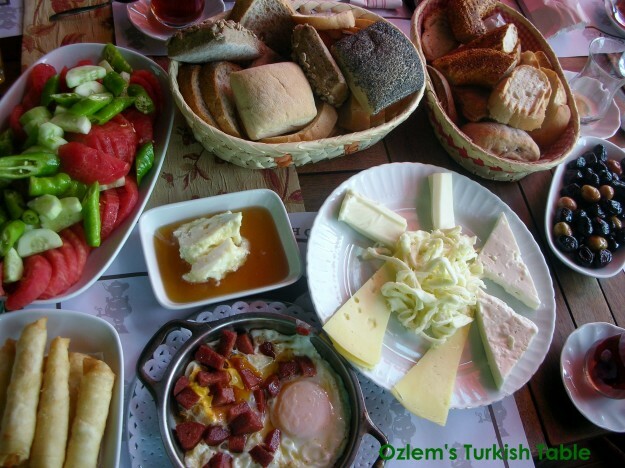 The wonderful Turkish breakfast with simit, cay, sliced cucumbers and tomatoes, olives, cheese, eggs with Turkish sausage, sucuk, honey and more..my favorite meal of the day! 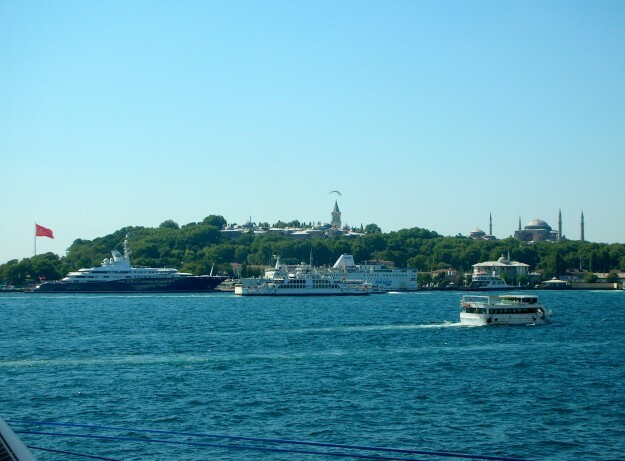 And, a leisurely Turkish breakfast shared with friends and family by the Bosphorus is simply unbeatable, for me. 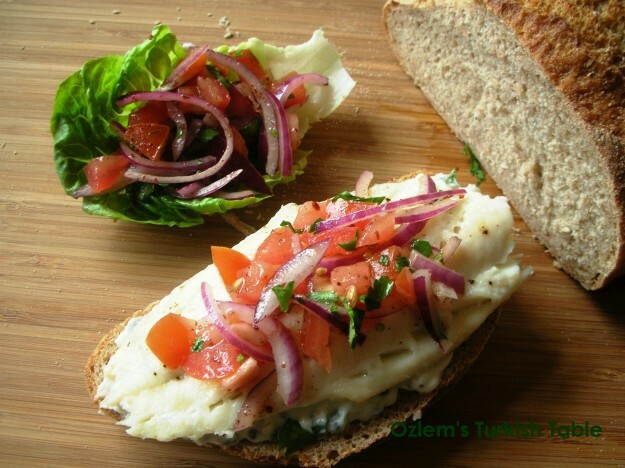 Balik & ekmek, Turkish grilled (or lighly fried) fish sandwich is another delicious street food at home. Fisherman prepare the catch of the day in their boats; a simple grill with salad, slices of onion on a fresh loaf of bread; just wonderful. I re-created my version of balik ekmek with a delicious, refreshing piyaz salad with sumac, onion rings, parsley and tomatoes by the side – all I need to do is to I close my eyes and visualize myself to be by the Bosphorus in Istanbul! Grilled fish sandwich goes so well with the refreshing piyaz salad of onion rings, tomato and parsley with sumac dressing. Turkish delight, lokum with rose water, pistachios, walnuts, or plain – sade -; all delicious treats. Fragrant, melt in the mouth Turkish delight is another treat I dearly miss – my children prefer Turkish delight over chocolate! – Then, you find a way to re-create it, and delighted to see that this Turkish delight recipe works really well! It is a wonderful treat to make for your friends and family for special occasions. Fragrant, home made Turkish Delight, easier than you think. I hope you can have a go and start re-creating any of your favorite food from your homeland; it is easier than you think, and can be really rewarding too. One way of getting in to re-creating your favorite dishes maybe attending a cookery workshop and see at firsthand how to break down the recipes and follow them. Many of participants attended my cooking classes expressed how pleasantly surprised that they can make the dishes easily and the experience was inspirational. 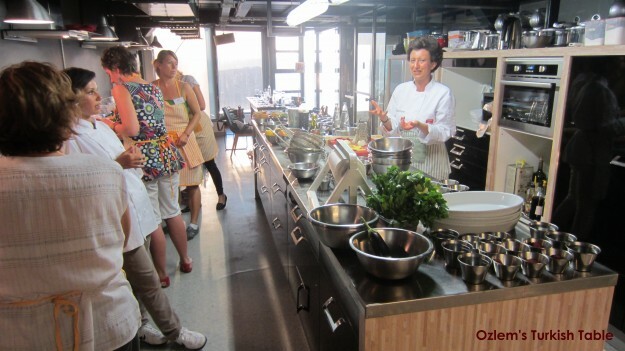 My next Turkish cooking class in Istanbul Culinary Institute will be on Feb 19th 2013. 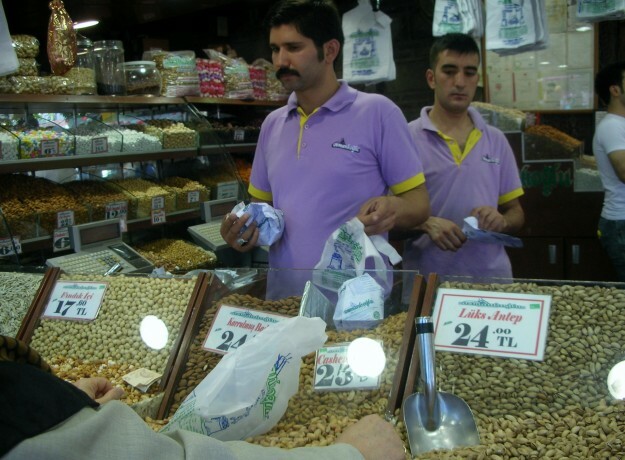 A Seasonal Cook in Turkey: Claudia’s delicious blog follows the seasonal produce in Turkey with wonderful market photos. 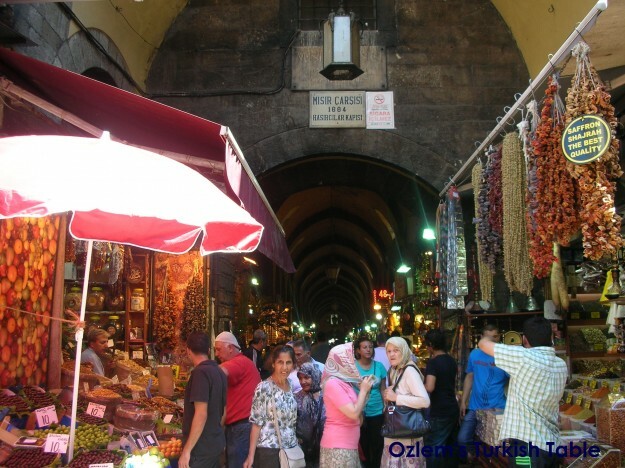 Claudia also does great Old City Walks with Istanbul Eats, be sure to check out. 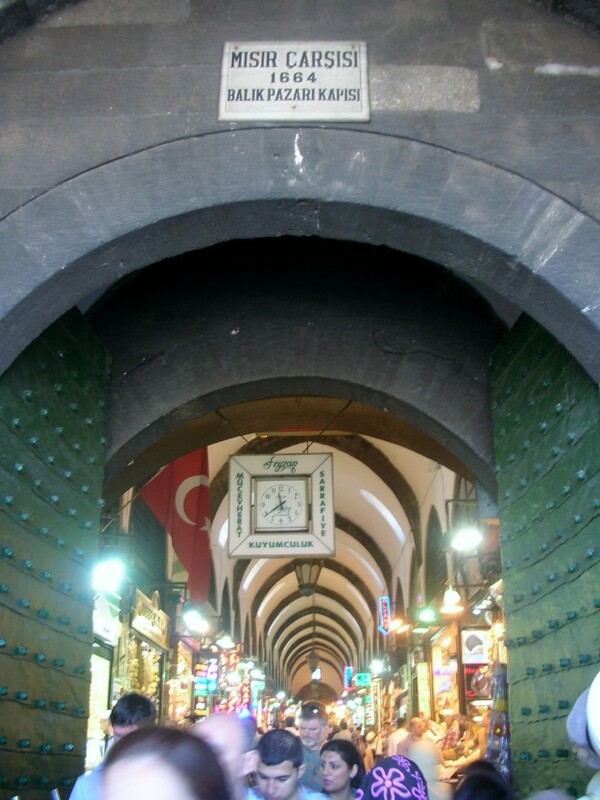 Entrance of Misir Carsisi, Spice Market - Istanbul; a foodie heaven. 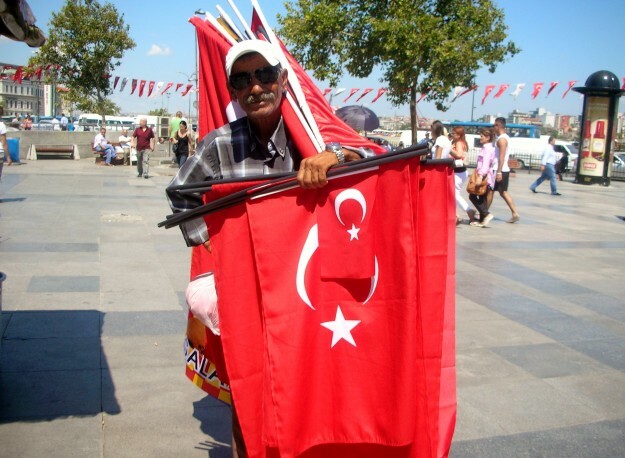 Turkey’s for Life, Turkish Travel Blog and Archers of Okcular feed us with fabulous photos, stories, news around Turkey, they are a joy to follow! 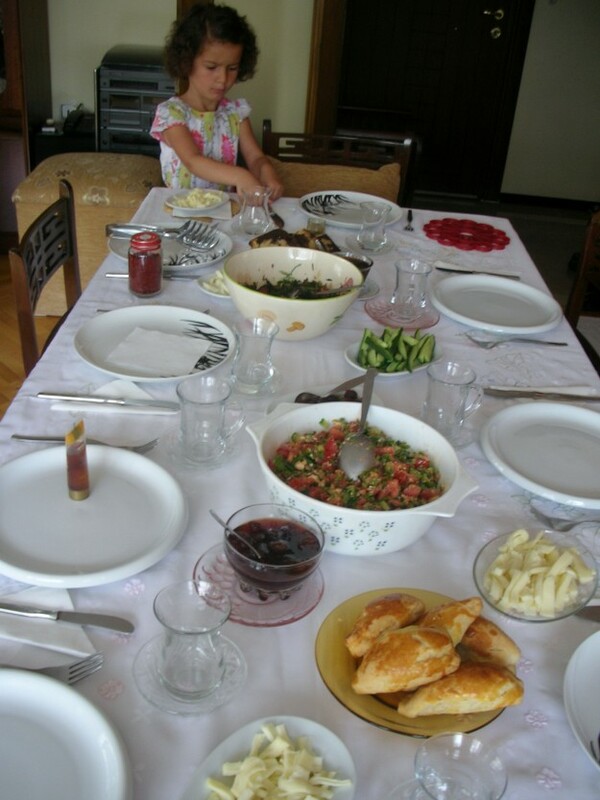 My Turkish Joys is another lovely blog, with wonderful recipes and travel photos from home. Joy is also a brilliant pastry chef and know all things about pastry, so be sure to check her blog out. 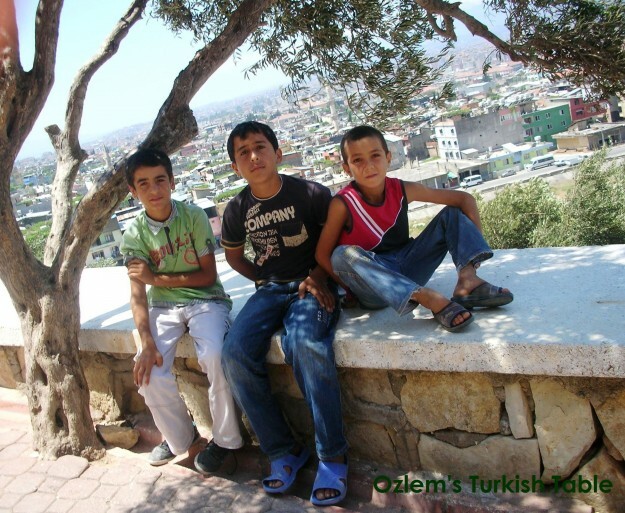 Let the children guide you in Antakya; they are always happy to help. Like many things, it is the human factor, friendly people; a warm smile, hospitality that makes a place special that makes us to go back there again and again. I think that sums up my homeland for me. Last but not least, I am also very grateful for your company to share a dose of home with me, following my blog, your comments and feedback; they are very precious, thank you very much. I hope these photos and information inspires you to explore Turkey, have a go at the recipes to treat yourself and family, friends. 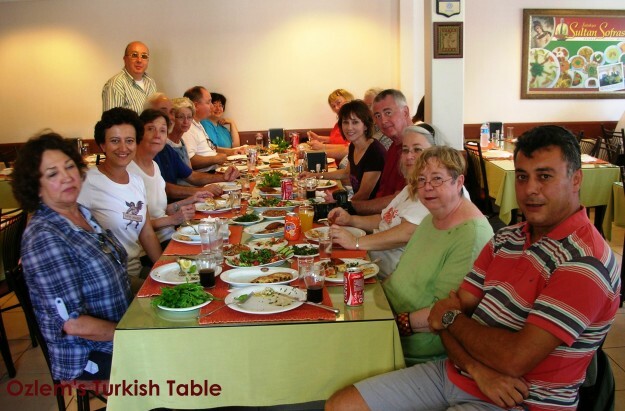 Sharing a delicious feast in Antakya during my culinary tour in 2009. 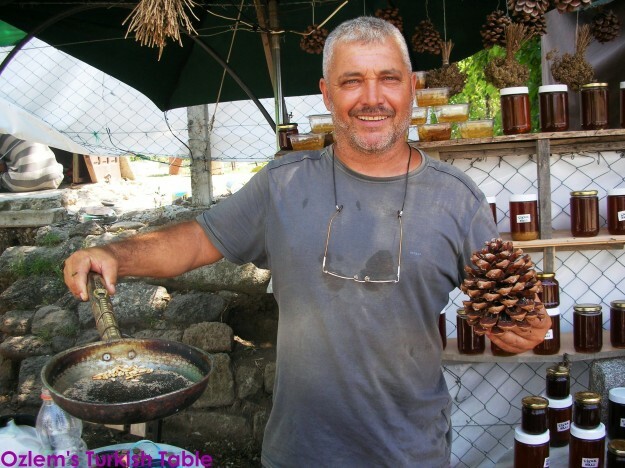 If you would like to join us and explore Turkey from a local’s perspective in my next culinary and cultural tour in April 2013 please contact me. It’s my last few days in Istanbul, the city I love, the city I feel alive – is there any city in the world you feel this way? 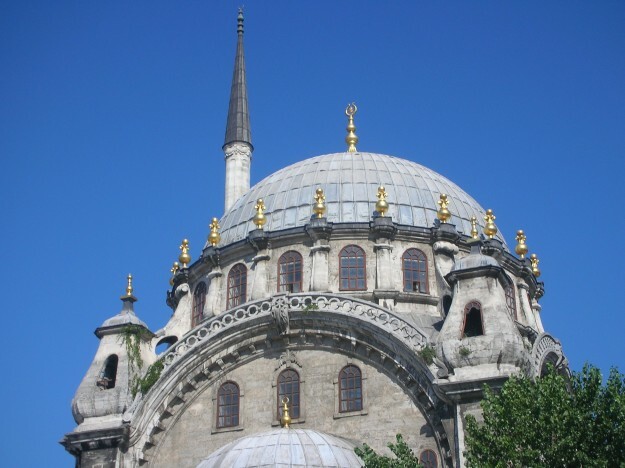 Today, I have been visiting a few of my favorite spots in Istanbul, old and new, both breathtaking in their own ways. 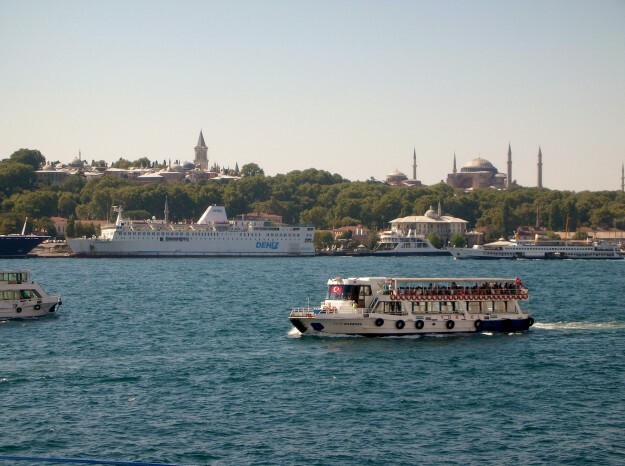 Istanbul is a city, where old and new co-exists. 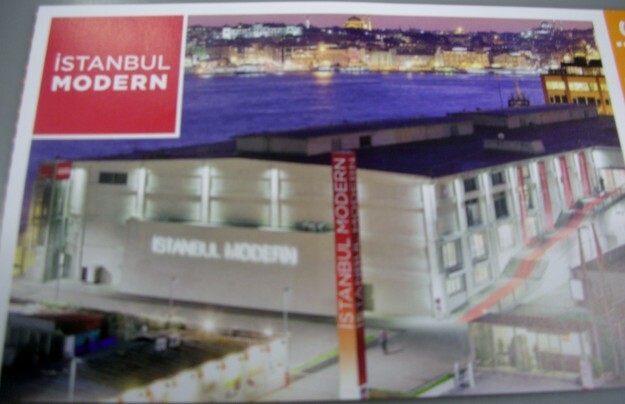 I have been to the wonderful Istanbul Modern – Istanbul Museum of Modern Art- in Karakoy, Istanbul today. 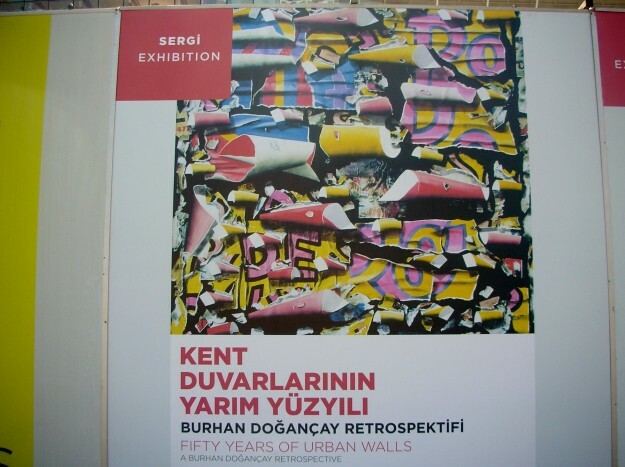 İstanbul Modern embraces a global vision to collect, preserve, exhibit and document works of modern and contemporary art and make them accessible to art lovers; a fascinating place to be. 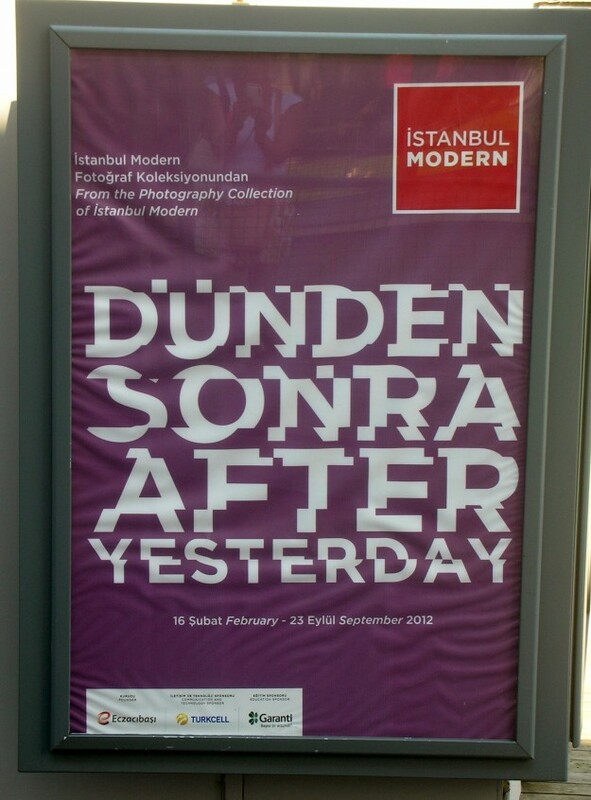 and After Yesterday; an exhibition of images from the İstanbul Modern Photography Collection. While at Istanbul Modern, you can have a nice break at their cafe, with stunning views of Sea of Marmara, Topkapi Palace and Hagia Sophia. Just next to the Istanbul Modern is one of my favorite mosques, Nusretiye Mosque (Cami), built in 1825; it still looks stuning, though unfortunately in need of repair. 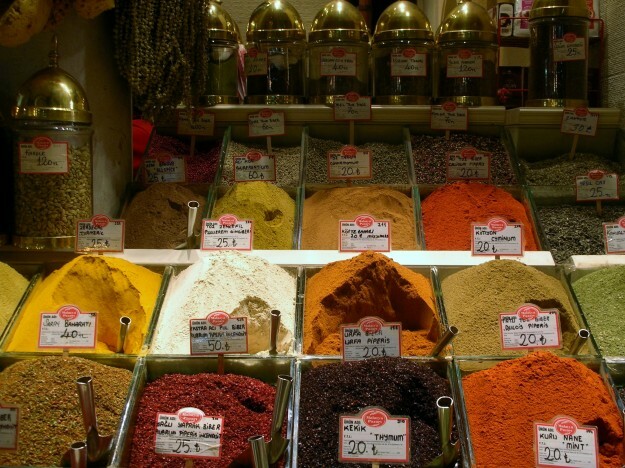 From Karakoy, you can take the tram to Eminonu; our next stop is Spice Market, Misir Carsisi! 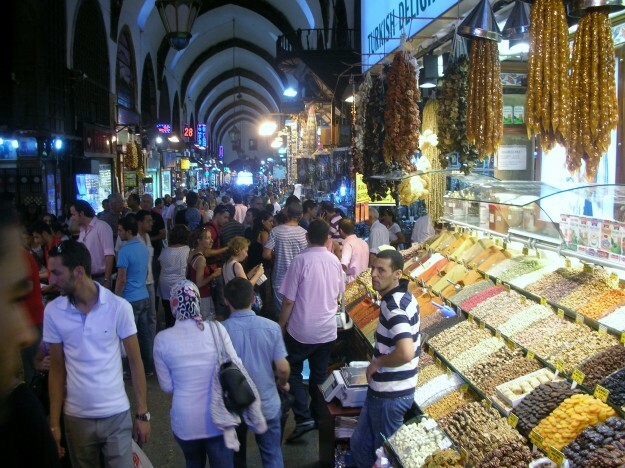 Built in 1664, Misir Carsisi, Spice Market is a feast to all senses; it’s the place both Turks and visitors come to stock up spices, nuts, dried fruits and nuts. 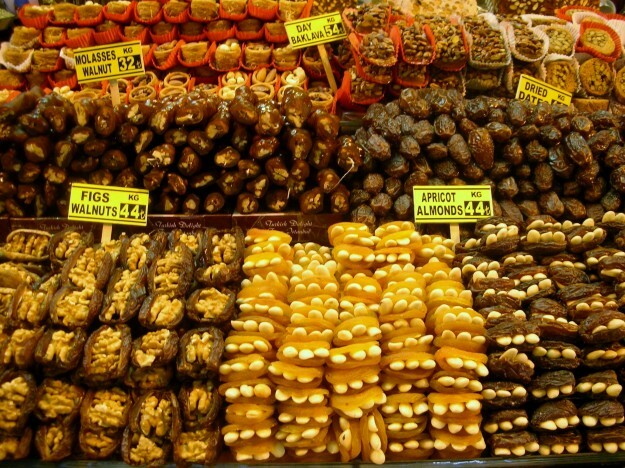 Dried apricots, figs and dates stuffed with nuts, very inviting! You can also get herbal and fruit teas at Spice Market; Turks love cay, black tea leaves, but the fruit tea is not a traditional drink with us. It is always a surprise to see the popularity of apple tea in Spice Market. Stalls and shops are friendly and generous to share the treats! 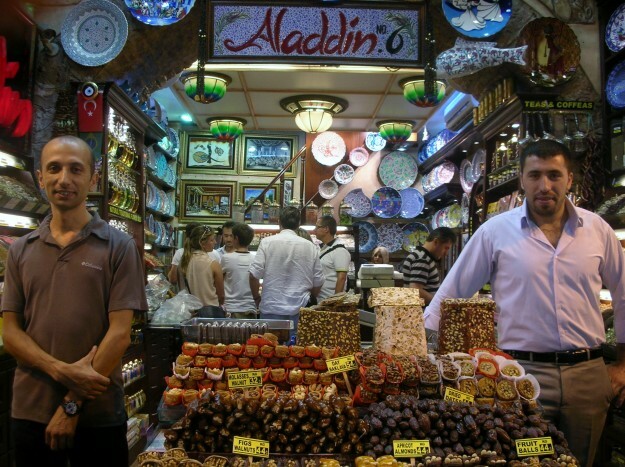 I am happily accepting the offer of Turkish Delights, who couldn't? 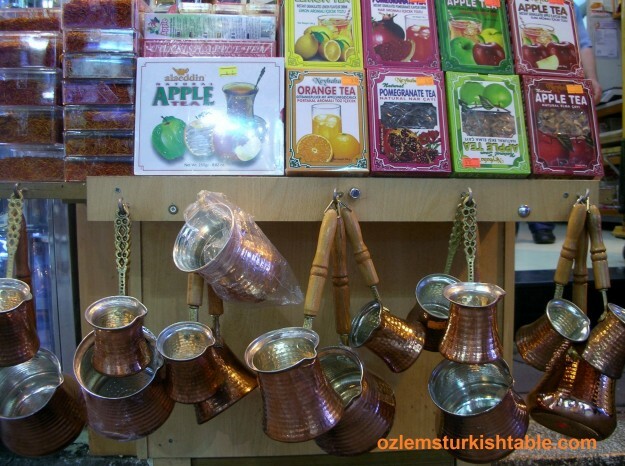 And here are Turkish Delights with different flavors; plain, with rose water, with pistachios, walnuts and many more. 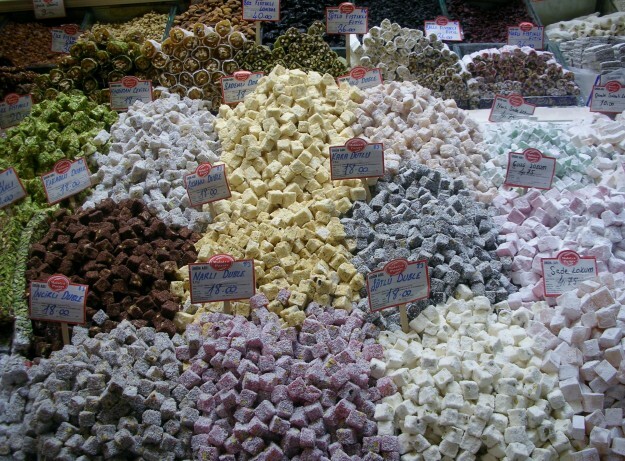 Did you know you can make your own Turkish Delights? Here is the recipe if you would like to have a go. How about spices, with their mesmerising smells and colors? We add wonderful flavors to our dishes with the use of spices in Turkish cuisine. Make sure to stock up on dried red pepper flakes, dried mint, cumin, ground black pepper, sumac, zahter (wild oregano) at the Spice Market. 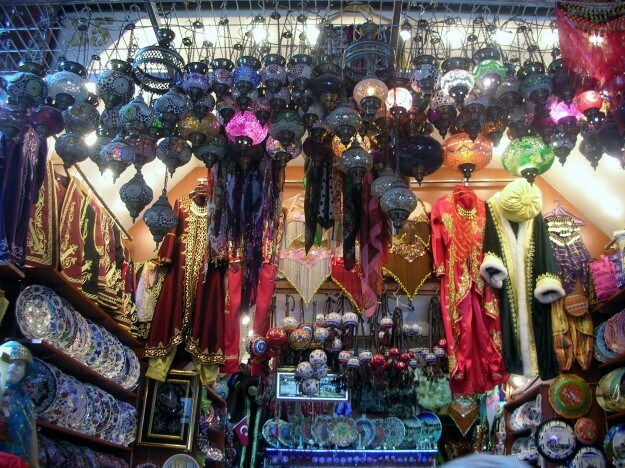 There are other treats like these colorful lamps, decorations, scarfs, even kaftans and costumes at Spice Market!